UFCW Local 1000, alongside the Legislative and Political Action Department, hosted a political conference in Oklahoma City on Jan. 24. This is the first time UFCW Local 1000 sponsored such a event in Oklahoma. Almost a dozen elected members of the Oklahoma Legislature met with Local 1000 members and staff to discuss the issues affecting the working men and women of the UFCW across Oklahoma, including country of origin labeling, paid sick days, cannabis, and health care. 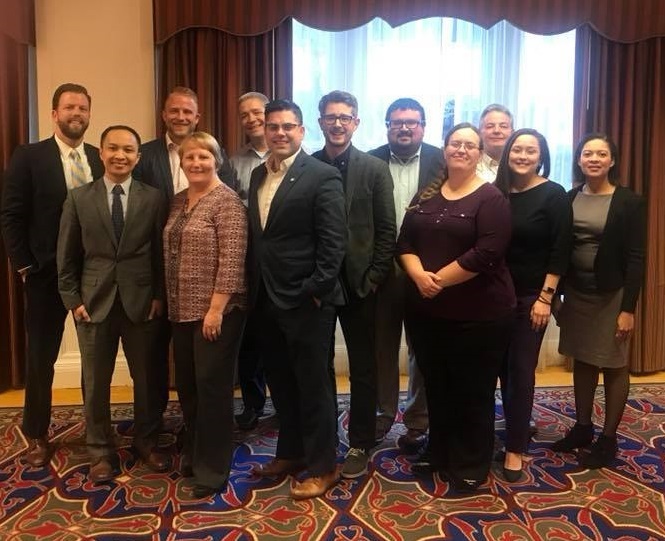 The state representatives and senators in attendance included two newly elected members of the legislature, Rep. Jacob Rosencrans and Sen. Alison Ikley-Freeman, who were elected in special elections where UFCW support was key. On Jan. 8, Working Families United protested the termination of Temporary Protective Status (TPS) for 200,000 Salvadorans currently working and living in America. The UFCW is one of five unions that form the Working Families United immigration campaign, which also includes UNITE HERE, IUPAT, Iron Workers, and Bricklayers. All five unions represent tens of thousands of TPS union workers in hospitality, construction, meat processing and trades. Maria Elena Durazo, general vice president of UNITE HERE, echoed that sentiment. “Today Trump’s DHS is taking nearly 200,000 law-abiding American immigrants and turning them from legal workers into targets for deportation,” Durazo said. 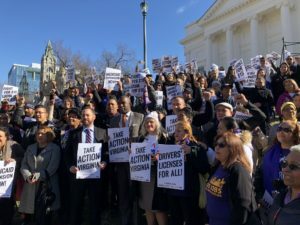 Looking forward, Working Families United member unions are pledging to keep the fight to save TPS up at the congressional level, including with a nearly one million dollar advocacy budget. 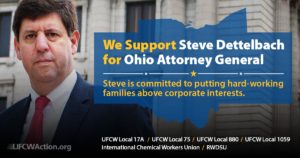 On Jan. 4, UFCW Locals 17A, 75, 880, 1059, along with the ICWUC and RWDSU, released the following statements after endorsing Steve Dettelbach for Ohio Attorney General. Collectively, these local unions represent over 80,000 hard-working Ohioans. “Steve Dettelbach has continually proven that he is completely committed to putting what’s best for everyday Ohioans above all else,” said Randy Quickel, president of UFCW Local 1059. 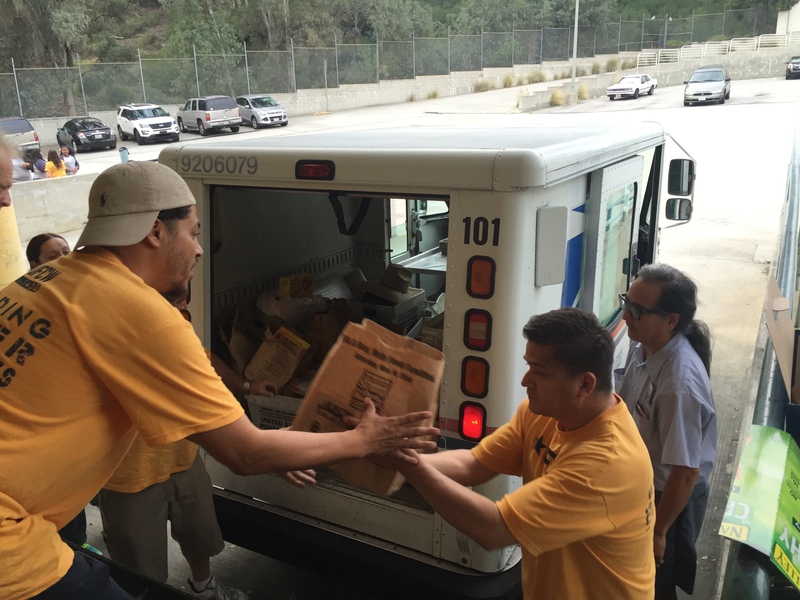 “Now, more than ever, we need and deserve leaders like Steve who will stand with and up for hard-working men and women when it matters most,” said Carl Ivka, president of UFCW Local 880. “Simply put, Steve Dettelbach will be an Attorney General who protects good jobs and better wages across Ohio. We endorse him with enthusiasm and look forward to helping him win this race,” said Kevin Garvey, president of UFCW Local 75. “Steve Dettelbach isn’t afraid to push back against predatory corporations and secure real progress for hard-working people. We look forward to him standing up for everyday Ohioans as our next Attorney General,” said Sonja Campell, president of UFCW Local 17A. “Steve Dettelbach knows how to work with the community and law enforcement to help make our communities safer for all,” said ICWUC President Frank Cyphers. “The time has come for Ohio to have an Attorney General who puts people before politics. Steve has spent his career fighting for justice for working people, no matter who they work for. Steve is not afraid to stand up to business owners who hurt working people – no matter what. We will fight for him to win this election because we know he will fight for us as Attorney General,” said RWDSU Regional Director Rick Marshall. 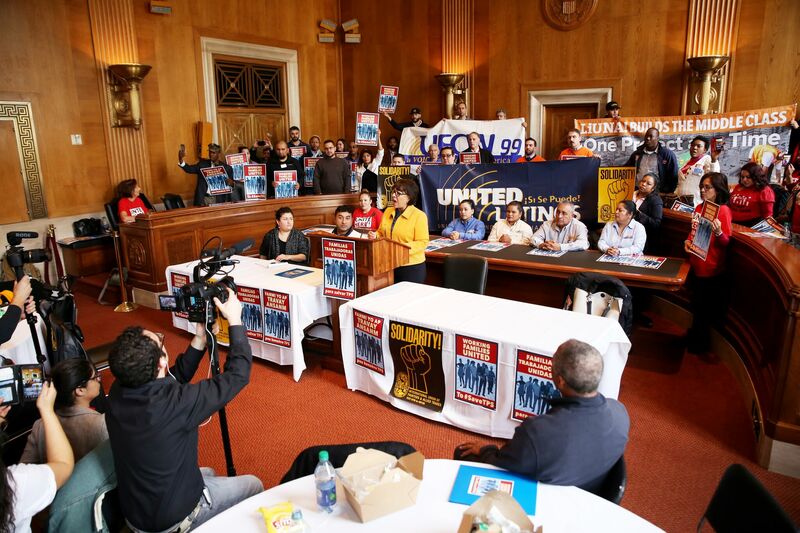 Last week, members from several local unions across the country, including UFCW Locals 99, 431, 876, 1189, 1776 and RWDSU, came to Washington, D.C., to deliver a message to our elected officials: Save Temporary Protected Status (TPS) and keep hard-working families together. This message was highlighted by the delivery of over 60,000 signed petitions to members of Congress. UFCW International Secretary-Treasurer Esther Lopez rallied members on the Hill. with a clear message.“Hard-working people who have lived here for decades and played by the rules should be offered a path to legalization and citizenship,” she said. TPS families have fled natural disasters, violence, instability, and ethnic, religious, and ideological persecution. They have also raised children here, regularly undergo DHS background checks, paying renewal fees on top of taxes, and are truly making America a better nation even as they work hard to build a better life for their families. Ending TPS for tens of thousands of hard-working families is a personal issue to our union family – that’s why we recently joined with UNITE HERE, IUPAT, Bricklayers, AFL-CIO and the Ironworkers to form a group called Working Families United to raise our united, collective voice on behalf of TPS holders. We support Sens. Ben Cardin (D-Md. ), Chris Van Hollen (D-Md.) and Diane Feinstein (D-Calif.)’s bill (SECURE ACT), and another introduced by Rep. Nydia Velázquez (D-N.Y.), H.R. 4253 (115). Together, we’re keeping the pressure on key congressional targets to support these measures. On Nov. 1, UFCW International President Marc Perrone issued a statement in support of the Senate Democrats’ “Better Deal” proposal regarding the bargaining rights of workers. The “Better Deal” proposal on collective bargaining seeks to create a mandatory mediation and arbitration process to ensure corporations and newly formed unions reach a first contract. 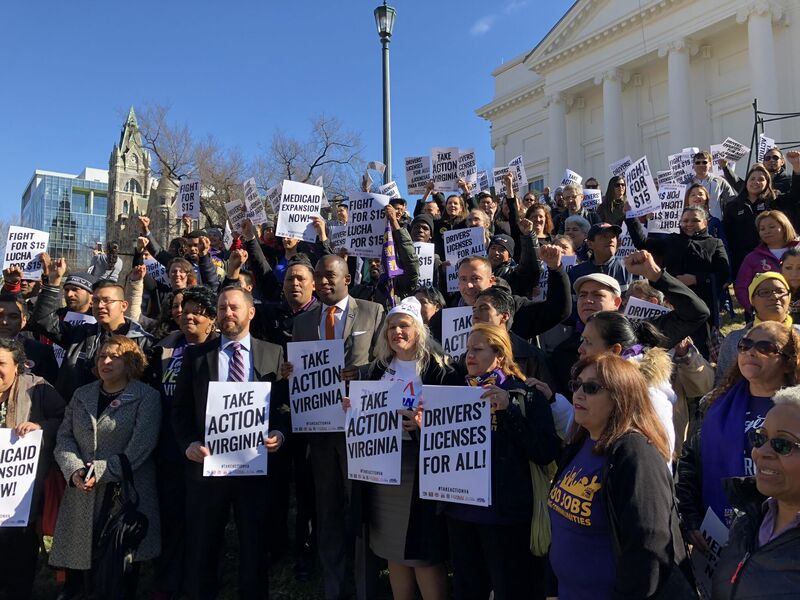 The proposal strengthens penalties on predatory corporations that violate workers’ rights, and combats misclassification of workers as supervisors and independent contractors. The proposal also strengthens the right of workers to strike for basic workplace improvements, including higher wages and better working conditions, bans state laws that undermine worker freedoms to join together and negotiate, and provides millions of public employees with the freedom to join a union and collectively bargain with their employers. 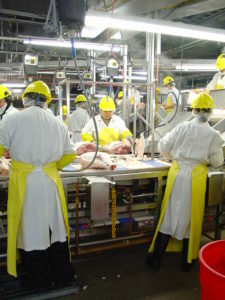 The proposal also seeks to streamline the National Labor Relation Board’s (NLRB) procedures to secure worker freedoms and effectively prevent violations, protect the integrity of union elections against coercive captive audience meetings, and use federal purchasing power and policy to help expand opportunities to negotiate. “We must build an economy that works for all – not just those at the top. By strengthening the collective voice and negotiating rights of workers, the better deal proposal on collective bargaining begins to do just that. On Oct. 26, UFCW International President Marc Perrone issued a statement regarding the Agricultural Guestworker Act (H.R. 4092), which puts American jobs and the safety of our food at risk. The bill passed the House Judiciary Committee by a vote of 17-16 on October 25. This bill will allow 450,000 visa holders to work in agriculture and meat processing jobs, and encourage irresponsible employers to displace American workers. Rather than require that new H-2C workers be paid at similar rates so that they cannot be used to displace workers and drive down wages, the bill simply requires that employers attempt to recruit workers at $10.88 per hour. If U.S. workers don’t apply at that wage rate, the employer would be authorized to bring in hundreds, or even thousands, of guestworkers at the $10.88 figure—a fraction of what meat and poultry workers in America currently earn. “The Agricultural Guestworker Act is a direct threat to American jobs, wages, and food safety. “It will flood the meat processing sector with hundreds of thousands of untrained visa holders, effectively destroying middle class jobs that are currently held by hard-working American families who play a critical role in the safety of our food. “This bill will also make it easier for guestworkers to be exploited and encourages them to take on work that is demonstrably unsafe without years of training.